Francisco Oller (1833–1917) was among the most celebrated painters to emerge from the Caribbean in the nineteenth century. His talents were evident when he was a young artist in San Juan, Puerto Rico, and they were further developed during four sojourns in Europe. 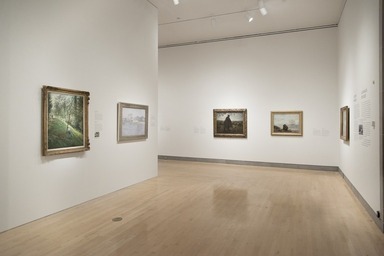 There he absorbed and reconfigured the radical styles of Realism, with its democratic approach to everyday subject matter, and Impressionism, with its emphasis on the sensation of spontaneous and momentary effects of light and atmosphere. 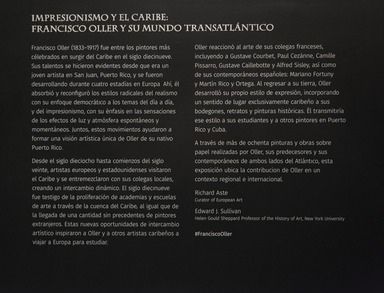 Together these movements helped Oller form a unique artistic vision of his native Puerto Rico. 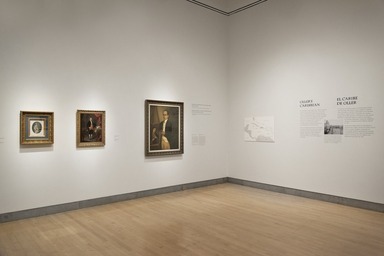 From the eighteenth to the early twentieth century, European and American artists visited the Caribbean and intermingled with their local counterparts, creating a dynamic exchange. 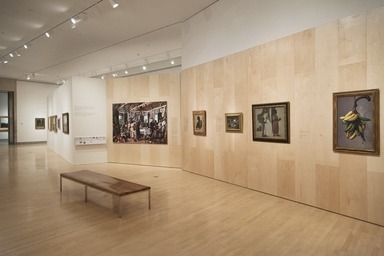 The nineteenth century witnessed the development of academies and art schools throughout the Caribbean basin, as well as the arrival of an unprecedented number of foreign painters. 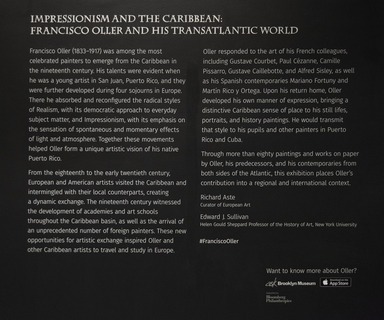 These new opportunities for artistic exchange inspired Oller and other Caribbean artists to travel and study in Europe. 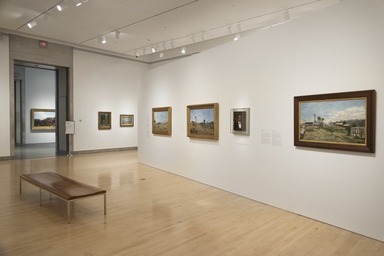 Oller responded to the art of his French colleagues, including Gustave Courbet, Paul Cézanne, Camille Pissarro, Gustave Caillebotte, and Alfred Sisley, as well as his Spanish contemporaries Mariano Fortuny and Martín Rico y Ortega. Upon his return home, Oller developed his own manner of expression, bringing a distinctive Caribbean sense of place to his still lifes, portraits, and history paintings. He would transmit that style to his pupils and other painters in Puerto Rico and Cuba. 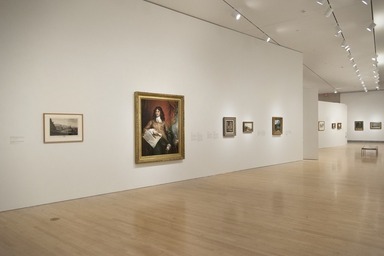 Through more than eighty paintings and works on paper by Oller, his predecessors, and his contemporaries from both sides of the Atlantic, this exhibition places Oller’s contribution into a regional and international context. Francisco Oller (1833–1917) fue entre los pintores más célebrados en surgir del Caribe en el siglo diecinueve. Sus talentos se hicieron evidentes desde que era un joven artista en San Juan, Puerto Rico, y se fueron desarrollando durante cuatro estadías en Europa. Ahí, él absorbió y reconfiguró los estilos radicales del realismo, con su enfoque democrático a los temas del día a día, y del impresionismo, con su énfasis en las sensaciones de los efectos de luz y atmósfera espontáneos y momentáneos. Juntos, estos movimientos ayudaron a formar una visión artística única de Oller de su nativo Puerto Rico. Desde el siglo dieciocho hasta comienzos del siglo veinte, artistas europeos y estadounidenses visitaron el Caribe y se entremezclaron con sus colegas locales, creando un intercambio dinámico. El siglo diecinueve fue testigo de la proliferación de academias y escuelas de arte a través de la cuenca del Caribe, al igual que de la llegada de una cantidad sin precedentes de pintores extranjeros. Estas nuevas oportunidades de intercambio artístico inspiraron a Oller y a otros artistas caribeños a viajar a Europa para estudiar. Oller reaccionó al arte de sus colegas franceses, incluyendo a Gustave Courbet, Paul Cézanne, Camille Pissarro, Gustave Caillebotte y Alfred Sisley, así como de sus contemporáneos españoles: Mariano Fortuny y Martín Rico y Ortega. Al regresar a su tierra, Oller desarrolló su propio estilo de expresión, incorporando un sentido de lugar exclusivamente caribeño a sus bodegones, retratos y pinturas históricas. Él transmitiría ese estilo a sus estudiantes y a otros pintores en Puerto Rico y Cuba. A través de más de ochenta pinturas y obras sobre papel realizadas por Oller, sus predecesores y sus contemporáneos de ambos lados del Atlántico, esta exposición ubica la contribución de Oller en un contexto regional e internacional. The Caribbean is a vast region with no fixed boundaries. It includes islands colonized by Spain, France, Great Britain, the Netherlands, Sweden, and Denmark and bordering mainland nations such as Mexico, the United States, and Venezuela. 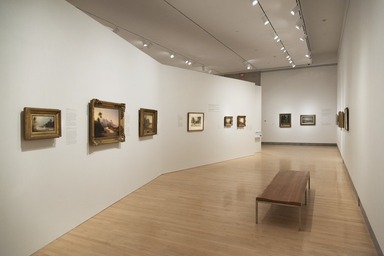 The eighteenth- and nineteenth-century portraits and landscapes in this section describe the Caribbean basin, its centers of commerce, and its diverse populations, including indigenous peoples and the Africans and Europeans who arrived after 1492. 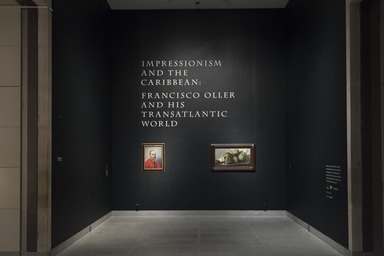 Despite the region’s long history of colonialism and slavery, artists from Europe and throughout the Americas created idealized images of an allegedly tranquil and racially harmonious Caribbean society. Such representations contrast with Oller’s more realistic images of Puerto Rico. El Caribe es una extensa región sin fronteras fijas. Incluye islas colonizadas por España, Francia, Inglaterra, Holanda, Suecia, Dinamarca y naciones continentales que lo bordean, como México, Estados Unidos y Venezuela. Los retratos y paisajes de los siglos dieciocho y diecinueve en esta sección describen la cuenca del Caribe, sus centros comerciales y sus diversas poblaciones, incluyendo indígenas y africanos y europeos quienes llegaron después de 1492. A pesar de la larga historia de colonialismo y esclavitud de la región, artistas de Europa y de las Américas crearon imágenes idealizadas de una sociedad caribeña supuestamente tranquila y racialmente armoniosa. Tales representaciones forman un contraste con las imágenes más realistas de Puerto Rico de Oller. As a Spanish citizen raised in an overseas colony, Oller was naturally drawn to the Iberian Peninsula. He worked in Madrid on two occasions; both were crucial to his artistic development. He first traveled there at age eighteen and stayed for two years (1851–53), enrolling in the Royal Academy of Fine Arts and studying with Federico de Madrazo, the future director of the Prado Museum. The Prado was a major repository of Old Master paintings that served as Oller’s chief source of inspiration. There, he assimilated the realistic style and sober subject matter of Diego Velázquez and Francisco de Goya. Prior to his second and final Spanish sojourn (1877–84), Oller was named court painter to King Amadeo I. 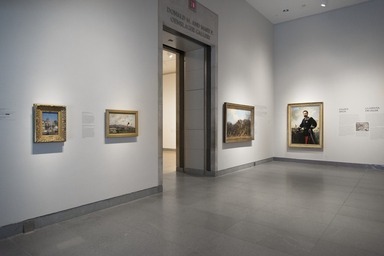 In this role he created official portraits, paintings of private interiors, landscapes, and a rare contemporary history painting titled The Battle of Treviño (on view here). 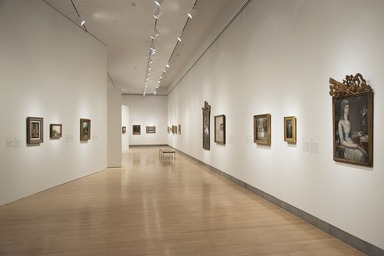 The paintings from this period were executed with lively, rapid brushwork, reflecting contemporary artistic trends also embraced by Mariano Fortuny y Marsal and Martín Rico y Ortega, among others. primera a los dieciocho años y permaneció por dos años (1851–53), inscribiéndose en la Real Academia de Bellas Artes y formándose con Federico de Madrazo, el futuro director del Museo del Prado. El Prado era un depósito importante de pinturas de los viejos maestros, los cuales le sirvieron a Oller como fuente principal de inspiración. Ahí, él asimiló el estilo realista y el tema sobrio de Diego Velázquez y de Francisco de Goya. Antes de su segunda y final estadía en España (1877–84), Oller fue nombrado pintor de la corte del rey Amadeo I. 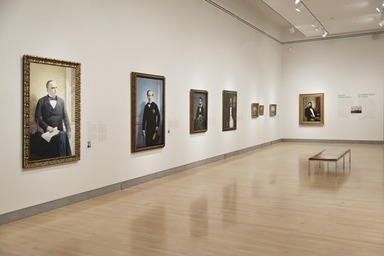 En este rol, creó retratos oficiales, pinturas de interiores privados, paisajes y una excepcional pintura de historia contemporánea titulada La Batalla de Treviño (en exhibición aquí). Las pinturas de este periodo fueron ejecutadas con rápidas y vívidas pinceladas, reflejando las tendencias artísticas contemporáneas también adoptadas por Mariano Fortuny y Marsal y Martín Rico y Ortega, entre otros. In 1858, at age twenty-five, Oller went to Paris, then the center of the Western art world. He stayed there through 1865, in the first of three sojourns. At this time, Paris was being transformed into a modern world capital of art and commerce. Oller absorbed the classicism and Realism of well-known masters of the time such as Thomas Couture, Charles Gleyre, and Gustave Courbet. He also met the Caribbean-born painter Camille Pissarro and, later, Paul Cézanne, giving him entrée to future Impressionist circles. Oller returned to Paris for a second stay in 1873–77, when he practiced plein air (out-of-doors) painting and displayed a heightened sensitivity to the fleeting light effects favored by his French contemporaries. Like his friends, he painted in villages outside Paris, submitting paintings and drawings to the Salon exhibitions. 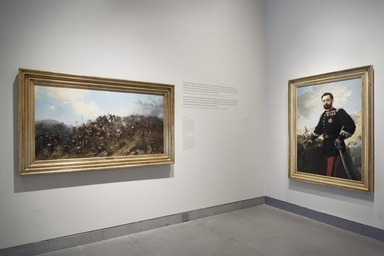 Oller came to Paris for the last time in 1895 to bring his masterpiece The Wake to that year’s Salon exhibition. By then his art was a fluid conflation of naturalistic Realism and Impressionism. En 1858, a la edad de veinticinco años, Oller se dirigió a París, entonces el centro del mundo del arte occidental. Él permaneció ahí hasta el fin de 1865, la primera de tres estadías. Durante esta época, París se estaba transformando en una capital mundial moderna de arte y comercio. Oller absorbió el clasicismo y realismo de los muy conocidos maestros de la época, tales como Thomas Couture, Charles Gleyre y Gustave Courbet. Él también conoció a Camille Pissarro, el pintor nacido en el Caribe y, después, a Paul Cézanne, lo cual le abrió las puertas a los futuros círculos impresionistas. Oller regresó a París para una segunda estadía en 1873–77. En esa época, practicó pintura en plein air, o pintura al aire libre, y demostró una extrema sensibilidad a los efectos pasajeros de la luz, favorecidos por sus contemporáneos franceses. Tal como sus amigos, pintó pueblos en las afueras de París, presentando pinturas y dibujos a las exposiciones del Salón. Oller fue a París por última vez en 1895 para llevar su obra maestra, El velorio, a la exhibición del Salón de ese año. Para entonces, su arte se había convertido en una fluida fusión de realismo e impresionismo. Despite more than twenty years of training and working intermittently in Madrid and Paris, Oller was a Caribbean artist defined by his native Puerto Rico. Unlike his friend Camille Pissarro, who would never come back to the region after leaving in 1855, Oller returned permanently to San Juan in 1884 (with the exception of a seven-month stay Paris in 1895–96). He thrived in Puerto Rico, portraying the island’s teachers, poets, planters, and politicians—local, Spanish, and (after the Spanish-American War) U.S. subjects alike. 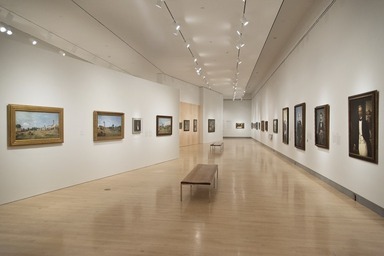 The customs and traditions of rural Puerto Rico informed his greatest work, The Wake, which he would later describe as “the object of all my love as an artist.” Oller also painted many sugar plantations, reflecting, through slightly melancholic compositions, a once-thriving sugar industry then on a downward slide. 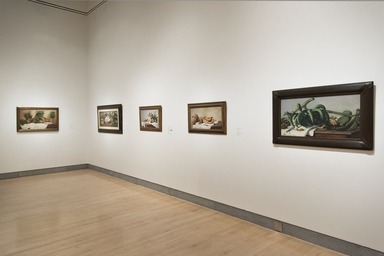 But perhaps his most powerful pictorial statements were his still lifes of coconuts, plantains, mameys, and guavas—local foodstuffs through which Oller conveyed a sense of place in an art literally rooted in the Caribbean. A pesar de más de veinte años de formación y trabajo intermitente en Madrid y París, Oller fue un artista caribeño, que se definía por su nativo Puerto Rico. A diferencia de su amigo Camille Pissarro, quien nunca regresaría al Caribe después de su partida en 1855, Oller regresó permanentemente a San Juan en 1884 (con la excepción de su estadía de siete meses en París, en 1895–96). Oller floreció en Puerto Rico, representando a maestros, poetas, plantadores y políticos de la isla —tanto locales como españoles y, después de la Guerra hispano-estadounidense, a sujetos estadounidenses por igual. Las costumbres y tradiciones del Puerto Rico rural formaron su obra maestra, El velorio, la cual más adelante describiría como “el objeto de todo mi amor como artista”. Oller también pintó muchas plantaciones de azúcar, reflejando, a través de composiciones levemente melancólicas, una industria azucarera alguna vez floreciente, que en ese entonces se encontraba en un periodo de deterioro. Pero quizá sus más poderosas declaraciones pictóricas fueron sus bodegones de cocos, plátanos, mameyes y guayabas—alimentos locales a través de los cuales Oller transmitió un sentido de lugar en un arte literalmente enraizado en el Caribe. During Oller’s lifetime, Puerto Rico underwent dramatic changes. It transitioned from a Spanish colony to a somewhat autonomous province to a U.S. territory. Through much of the nineteenth century, its economy had revolved around ingenios azucareros, or sugar plantations, driven by slave labor. By the turn of the century, the island boasted an emancipated population and a rapidly modernizing infrastructure. Two months before Oller passed away in San Juan in 1917, Puerto Ricans were granted U.S. citizenship under the Jones Act. Today Puerto Rico continues to occupy a complex political and economic position. As a commonwealth of the United States, the island has its own constitution, legislature, and governor. However, Puerto Rico lacks voting representation in the U.S. Congress, and while the estimated 4.9 million Puerto Ricans who live in the United States are able to vote in presidential elections, the 3.7 million Puerto Ricans living on the island do not have that right. Despite Puerto Rico’s shifting political identity, its culture remains defined by its mixture of indigenous Taíno, European, and African roots. Durante la vida de Oller, Puerto Rico sufrió cambios dramáticos. Se transformó de una colonia española a una algo autónoma provincia de España y, después, a un territorio estadounidense. A través de mucho del siglo diecinueve, la economía de Puerto Rico se basaba en gran medida en los ingenios azucareros, los cuales dependían de la labor de los esclavos africanos. 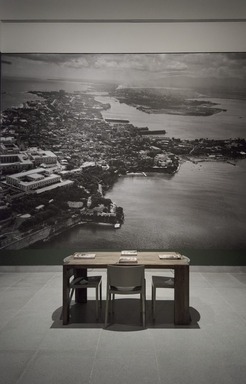 Hacia finales de siglo, la isla poseía una población emancipada y una infraestructura modernizada. Dos meses antes de que Oller muriera en San Juan en 1917, a los puertorriqueños se les concedió ciudadanía estadounidense bajo el Acta Jones. Hoy en día, Puerto Rico sigue ocupando una posición política compleja. Como un territorio no incorporado de Estados Unidos, la isla tiene su propia constitución, legislación y su propio gobernador. Sin embargo, Puerto Rico carece de representación de voto en el Congreso de Estados Unidos y, mientras que los 4.9 millones de puertorriqueños que viven en Estados Unidos tienen derecho de votar en las elecciones presidenciales, los 3.7 millones de puertorriqueños que viven en la isla no cuentan con ese derecho. A pesar de la identidad política cambiante de Puerto Rico, su cultura sigue definiéndose por su mezcla de raíces indígenas taínas, europeas y africanas. Campeche! He was a light that was lost in his day when art was a secret for Puerto Rico. !Campeche! Luz perdida en la oscuridad de aquellos tiempos en que el arte para Puerto Rico era un secreto. [The Battle of Treviño] is a masterpiece of drawing, its author being also outstanding as a skilled colorist. The composition is admirable; in spite of its being a battle, there is no clutter or disorder. The contrast provided by the exuberant treatment of nature is of great artistic effect. Nevertheless, the general tone is lighter than what a battle scene demands. The details are very accurate, the country perfectly felt. [La Batalla de Treviño] es un prodigio de dibujo, brillando también el autor como hábil colorista; es admirable como composición; a pesar de que se representa una batalla, no hay aglomeración ni desorden; el contraste de aquella naturaleza exuberante es de un gran efecto artístico; sin embargo, el tono general es más alegre de lo que pide una batalla; mucha verdad en los detalles; el país perfectamente sentido. Nations become great when their peoples are instructed. The people are the nation. Las naciones se engrandecen cuando el pueblo se instruye. El pueblo es la nación. I am very upset that Oller...will be unable to return to Paris, for he’ll probably be very bored in Puerto Rico and, too, without paints available, it must be difficult to paint. Siento mucho que...Oller no pueda regresar a París pues debe estar aburrido en Puerto Rico, y además, sin colores al alcance, le será muy difícíl pintar. Like the writer, the artist must participate in the epoch in which he lives; he must be of his country, of his people, if he wants to be authentic. El artista, como el literato, tiene que ser de la época en que vive; debe ser de su país, de su gente, si quiere ser auténtico. I remember seeing this self-portrait of Oller for the first time with my father over fifty years ago. I was immediately drawn to the intensity of the eyes. Oller was telling me something about himself, his strength and determination. The struggle and pain were reflected in the wrinkles of his face and the red attire displayed his fierce fighting spirit. The background is also very intense, and I believe that it represents the spiritual light of Puerto Rico, which will eventually be victorious over the many obstacles it has endured under Spanish rule and the Catholic Church. Every time I see this painting, I find something new. It is inspiring to me as an artist. The genius of Oller evokes national pride. A woman can be just as strong as a man. She can do whatever she wants. It doesn't matter if she's been told she can't. If it is something she wants to do, she will find a way. Don't ever let anyone tell you no. I remember my Tía Dulce, whose name in English translates to Aunt Candy, telling me this in secrecy before I returned from Puerto Rico back to my home here in New York City. These words have stuck with me since I last saw her and this painting reminds me of them. 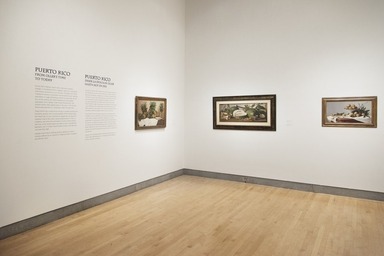 Francisco Oller’s works give us a window into Puerto Rico’s past during a time of great transition. His masterful paintings capture a physical landscape that would soon change, upon the American occupation of the island in 1898. From his iconic still-life portraits of the tropics to his symbolic paintings of the island and its people, he gave us a visual history that reflected both beauty and social strife. Sugarcane fields that once fueled the island economy have today been replaced by GMO food crops. Oller painted a pre-industrial Puerto Rico that has never again been the same. This painting resonates with me on multiple levels. As a lifetime educator of color, I was initially struck by the image of a black man, in a nineteenth-century setting, teaching and intimately holding a white child. This scenario would have been almost inconceivable in pre–Civil War America. However, upon further examination, I also noticed the other “mixed race” children depicted in the painting. The process of miscegenation and cultural erasure, initiated by the Europeans and continued in the United States after the Spanish-American War, is viewed by many today as a cultural ideal. Puerto Rico’s mestizo identity and society—encompassing people of indigenous, African, and European ancestry—is held up as a model for interracial and multicultural harmony. However, for me these “mixed race” children represent the tumultuous history of invasion, imperialistic conquest, and colonization that has plagued this island nation, my island nation, since the period of contact with Europe in the late fifteenth century. And the façade of racial and cultural harmony serves as a smokescreen for the ongoing oppression, inequality, and discrimination of Afro-Caribbean and indigenous people in the Americas. To my eyes the plantains hanging from the ceiling could be a tribute to the African Orisha Shango, the Yoruba thunder god who survived the transatlantic slave trade, and a symbol of his presence and divinity. The central figure watching over the child with his wooden walking stick could be a priest of Elegua, the Orisha who starts and ends all official ceremonies. Or could he be a spirit medium guiding the child’s spirit? Is the mother of the deceased child—the only figure dressed totally in white—honoring the divinity Obatala, the creator of life? Are the songs being sung by the woman by the door with a maraca and the music of the men playing guitars and güiros songs helping to make the child’s journey to the spiritual world a pleasant one? We may never know the answer to these questions, since it was primarily the clergy who published the writings on religious issues of the time. What we do know is that there are questions that have yet to be understood, along with their influence on Oller’s Velorio and the Puerto Rican–Caribbean aesthetic. Within Still Life with Bananas, Jug, and Cashews, I feel initially drawn to the caju fruit, the fruit attached to the cashew nut that is rarely acknowledged. The placement of the bananas is made with deliberate and careful intention, as is the half-full water jug. Who are these fruits carefully presented and placed for, who is behind the harvesting, and finally, who is delivering the fruits to those who consume them? 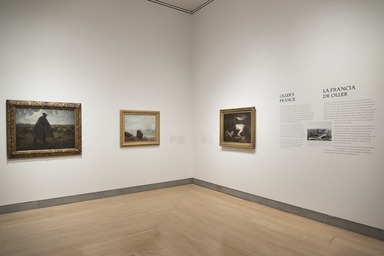 During Oller’s time, African enslaved labor was used on farms on the island of Puerto Rico, and his work seems to address this presence in an oblique manner. This hinting at the slave labor used to source these full, sweet, bountiful fruits speaks to a tension between the sweet and the violent. 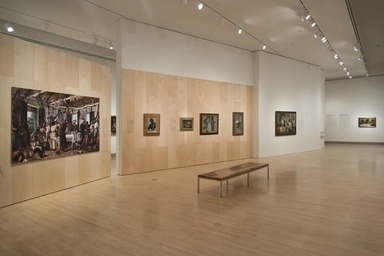 June 1, 2015 Eighty-four paintings and works on paper by Oller, his predecessors, and his contemporaries in the Caribbean, Europe, and the United States will be on view from October 2, 2015. through January 3, 2016, at the Brooklyn Museum. 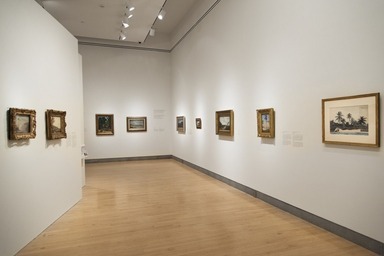 This exhibition brings together masterpieces from the Museum’s collection and paintings from private collectors and museums in Paris, Puerto Rico, Miami, Washington, D.C., and the New York City area. The exhibition examines the exchange between Europe and the Caribbean in the eighteenth century and presents the Caribbean as a region of intense creativity (where local artists intermingled with those from abroad) from the eighteenth to the twentieth century. 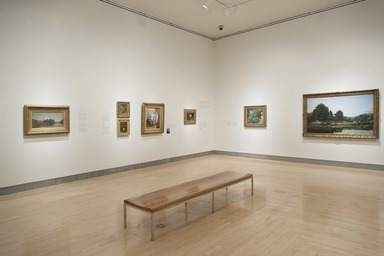 The European and North American presence and influence is represented through works by such eminent artists as Camille Pissarro (an intimate friend of Oller in Paris) and Frederic Edwin Church, among many others. 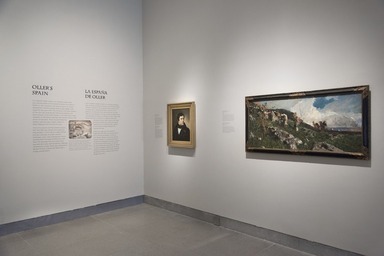 The exhibition celebrates Oller's important contributions to both the Parisian avant-garde and the Puerto Rican school of painting within a larger artistic, geographic, and historical context. 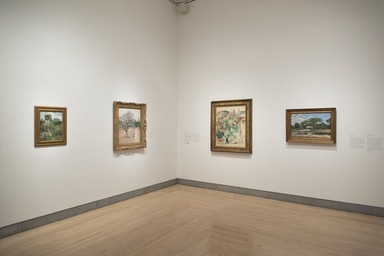 Included in the exhibition is a plein air portrait of Oller's friend Paul Cézanne, illustrating Oller's place in avant-garde circles abroad and highlighting his embrace of Barbizon school painting practices. Also featured is Oller's mature masterpiece Hacienda La Fortuna, an Impression-inspired depiction of one of southern Puerto Rico’s large sugar-mill complexes. Oller was commissioned by the Barcelona émigré José Gallart to paint a series of "portraits" of his five Puerto Rican sugar plantations. This landscape is an early morning view of Gallart's most significant plantation, showing rural Afro–Puerto Rican laborers gathering sugar cane in the foreground and the planter’s home, flanked by his warehouses (former slave quarters) and his sugar mill, in the middle distance. Oller trained first in Puerto Rico, then in Spain under the painter Federico de Madrazo, and finally in France in the celebrated Paris ateliers of Charles Gleyre and Thomas Couture. 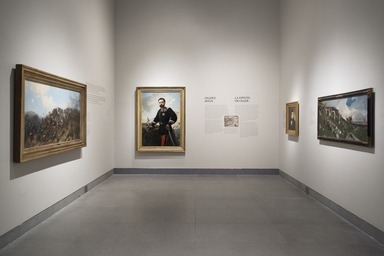 In the French capital, he joined the avant-garde circles of Gustave Courbet, Pissarro, Cézanne, Claude Monet, and Pierre-Auguste Renoir and exhibited, as "a disciple of Courbet," at the annual Salon exhibitions and the 1875 Salon des Refusés. 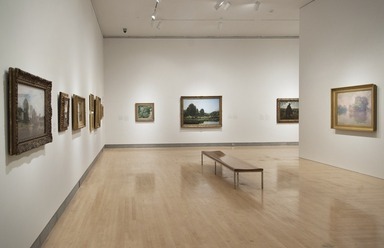 Oller's twenty-one years in Europe informed his novel Realist-Impressionist idiom, which he transmitted to his students and other painters in Puerto Rico and Cuba. 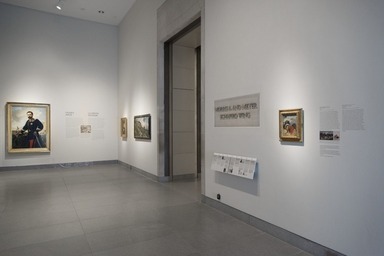 Generous support for this exhibition is provided by the National Endowment for the Arts and Christie's. Additional support is provided by Carmen Ana Unanue, Salomé Galib and Duane McLaughlin, Julius Leiman-Carbia and Kyle T. Smith, Dr. Blas Reyes and Dr. Hilda Capo, and the Norman and Arline Feinberg Exhibition Fund. The exhibition's sponsor is Univision. Edward J. Sullivan's book From San Juan to Paris and Back: Francisco Oller and Caribbean Art in the Era of Impressionism, published by Yale University Press, will accompany the exhibition.